7000 baht / per month. 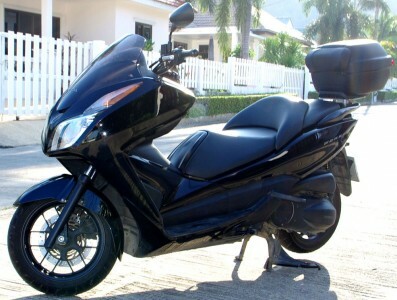 Hua hin Motorbike Rental represents to you: Honda Forza 300cc is the last born of Honda scooters. This model undoubtedly delight fans of Maxi Scooter! Ideal model for drive outside of town but also very handy for city driving. This particular model has a particularly effective and reassuring combined ABS system (C-ABS Honda). A little bit of everything. That’s the way Honda wants you to think about its Forza. For those not needing the heft and power, but still want to scoot about with a little more gusto than the PCX150, Forza is Honda’s answer. Equipped with a 279cc liquid-cooled Single and plenty of storage space, the Forza is the ideal commuter. For a select few, it could even serve as a person’s only motorized vehicle. Let’s dig deeper into what makes it tick. The first thing you notice when hopping aboard the Forza is the need to lift your leg over the center tunnel. A true step-through scooter design this is not, however it’s low 28.2-inch seat height is accessible by almost anyone. You sit long and low in the Forza, almost in cruiser-like fashion. The footwells extend and swoop towards the front tire giving the rider the option to sit upright or kick their legs up like a recliner.